I’m on the second in my series on painting watercolor flowers, woohoo! I’m using my Koi again…..in preparation for my two-week trip to paint my way through Europe! This time it’s a more graphical style of painting – no background, just letting that white space speak on its own. (If you missed last week’s floral #1, click HERE.) Enjoy the video below, or click HERE to watch in HD on YouTube. From the feedback so far on last week’s flower – the watercolor flowers series is likely to continue! I love your series and your painting and your explanation about what you’re doing. However, I don’t care for the music in the background. It would work if you weren’t talking, but the two together doesn’t work for me! So pretty! Love how the flowers pop against the white background! I love poppies and I love other people’s watercoloring. I hope to get past my confidence block and try this step by step with your video. Thanks for another wonderful vid! Sandy, boo boos or not, I love your watercoloring. Absolutely beautiful! I need to get the confidence to try this. You are definitely inspiring me!! Thank you so much for sharing!! Love watercolor, love your work and love you. Thanks so very much. I am learning so much. I’m so glad the watercolor series will continue. You create such beautiful cards and are an awesome teacher! Thank you for sharing your talent with us! I hope you have a fantastic trip and enjoy every minute!! Yay! I’m glad the watercolor series will continue. I really, really enjoy watching and listening to you – you are an excellent teacher. I am fascinated by your paintings and can’t wait for #3…and #4… and ….. Have a wonderful trip – enjoy and thank you so much for your inspiration! This is so beautiful!! I LOVE how you created these flowers!! I love love love these watercolor videos. I am learning so much, thank you! The poppies make my heart sing! This is stunning! LOVE it! Boy, this turned out great, too. Yes, I see the coolio buttons. Another beautiful painting! I can see the buttons. Sandy, I am so proud of you on your traveling to Europe. I, must admit, that I have a problem going to places that require that much courage! Blessings and may the God of your understanding guide and protect you May doors open in a way that you would never expect. Thank you for getting me over the hump when it comes to watercoloring! Great series! Can see the connection buttons on my desktop computer. All seem to be working OK. Thanks for another lovely video. It works now!!! Awesome video! You make everything look so beautiful and easy! Great card! These are so pretty Sandy. Seeing all your beautiful watercolor work is making me itch to dig out my long-tucked away supplies. It’s the only medium I ever worked in seriously, and though I did it for funI eventually sold most of what I painted and it made me happy to find loving homes for them. LOL hope you have a wonderful trip and better luck than I have had in all the many time I ‘packed to paint’ but barely managed to even sketch. No “coolio” buttons on the left, but they appear at the bottom of your post (for me anyway). Awesome flowers! Keep on colorin’! Hope it works for others! Love the card and cant wait to see the video! Hopefully that will get fixed soon. I was just wondering if you prefer the Koi over the Kuretake watercolors? Your cards are always an inspiration, keep them coming! Sorry! Should work now. So far I like both, but too new at wc to make a judgment…lol. So glad the watercolor series will continue … yay!!! I agree with Dawn about finding “paint-worthy” subjects everywhere in Europe. If anyone can capture beauty [in any medium], it’s you. Relax, enjoy, and be safe. No link to watch the video and I keep getting error 404. Nice watercolor! Hi Sandy! Yes, I see coolio buttons on my desktop… Like others the link doesn’t work, but if you copy it, paste it, and correct the spelling to drop the extra “u” in this http://youtu.be/LBsyoMjiUys it gets you there. So just a typo. Actually, in the search bar on the error page, it indicates ” Youtu.be”. Maybe the link was input this way? I can see the share buttons on the left using my laptop. Can’t connect to video on your new site or on U-Tube! That is just so beautiful. I love the white background. I love your beautiful card! Unfortunately there is no link to watch the video on your site and the link to the youtube sends me to Error 404. 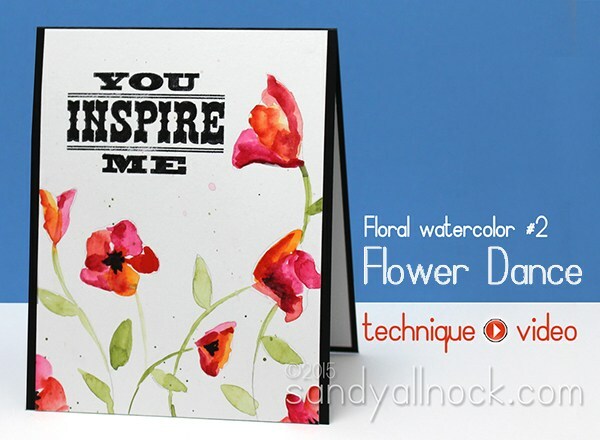 Hi Sandy, how is the Koi watercolor in comparison with the Tambi ones? Love your watercolor segments. Your creativity and talent are just amazing. I watch your videos over and over and always find something that I didn’t see before. Thank you for sharing. Your watercoloring of the flowers is fabulous. 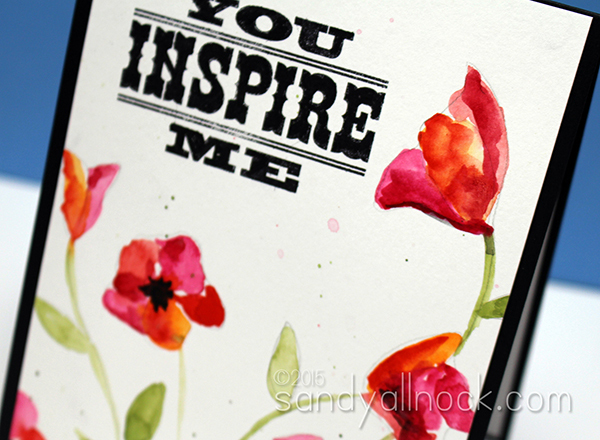 Ooooh – I like this one even better – these poppies feel more free somehow… Love watching you achieve this look – I’m inspired to keep trying.